I’m not sure when the average child gets exposed to gambling, but I personally got a fairly young start. No my parents didn’t drag me to the casinos or horse racing track as a toddler. Instead I took the initiative with getting into gambling on my own. I must’ve been only 6 or 7 at the time, but I clearly remember walking into that corner store with my $5 in hand. My best friend had let me in on a little secret – this particular corner store owner had no problem making some extra money by selling lottery tickets to minors. I guess in the poorer area of a small town, people can easily get away with things like that. Seriously though, profiting off kids like that?! Come on man! So without hesitation this guy hands over my five gold rush scratch and win tickets. Here I was thinking I was being a smart entrepreneur. If I was buying five of them, I thought I was almost guaranteed to win. Little did I know that the system is designed to make the government money, not to make all the suckers rich. Eagerly I got busy scratching those tickets, eyes lighting up as each time I would get two matches and came oh so close to getting that 3rd match. You know the ones where you have to count all the zeros just to make sure. Well as ‘luck’ would have it, I scored big and won $2 with my big purchase. And with that I was hooked. Like any young entrepreneur, I didn’t see that as recovering $2 off my little investment. No I had just scored two more chances to win big. Let it ride baby! Of course, I lost on those next two tickets, but in my mind I was just two tickets closer to my big jackpot. Luckily over the next few years I usually didn’t have that kind of spare cash and candy was usually the bigger priority. Still, once in a while I would fulfill that gambling itch and head over to that unscrupulous corner store. Now some of you might be saying to yourself that buying sports cards is just collecting, but there most definitely is gambling elements involved. It started out innocently enough. As a gift I had received one of those hockey sticker books where your goal is to collect the entire set. So when I got a bit of money for chores around the house, I’d buy a pack of these stickers hoping to get the ones I was missing. As my allowance gradually increased, I moved on to actual hockey cards. I would start with the cheapest I could afford, but I’d eventually get lured to the more expensive ones. It was still essentially just collecting and harmless enough. At least it was better on my teeth to spend my money there instead of all on junk food. The problem arose when I got into buying the top of the line cards. In these sets there would be cards worth much more money. So you’d really get caught up chasing those illusive top dollar cards. There would be times when I would be lucky enough to find a mid-level card in my pack. Not surprisingly, the sports card store owner was another of those types who profits off of ignorant kids. He’d pay attention to when we found the cards worth more than a buck or two. He would easily convince us to trade those good cards for another pack or two. Just like the scratch and win tickets, I was all too willing to let it ride in hopes of getting that top value card. Hey, at least, I was building my collection, right? Unfortunately with the store owner’s help it was a collection of mostly lower end cards. Eventually I outgrew collecting hockey cards and went back to spending money on junk food again. Well wouldn’t you know, that corner store owner had no problem with selling me scratch and win tickets too. This time around it was the bingo scratch and wins that my friends and I got hooked on. For some reason there just seemed to be a high percentage of winners when those originally came out. In other words, someone in marketing was smart enough to get people hooked on this new popular game. I think they realized that the longer the process, people would get more entertainment from it and later use that as justification to keep playing. Over the years, I would keep playing, thinking that I was just increasing my odds of winning one of those bigger prizes. I would upgrade to the $5 bingo cards thinking that just increased my potential winnings that I was due for. I don’t think I ever won more than $20. To this day I still buy them once on a while, but I look at it as entertainment now. So what is your take on childhood gambling? How young were you when you got your first taste of gambling? Do you think there needs to be tighter restrictions on youth gambling? I’ve never really gambled a lot, but that is mainly due to the fact that my mother has a casino gambling addiction. I do dream of winning the lottery though! It’s funny how a parent’s addiction can sometimes be the best deterrent for a child from making that same mistake. I was that way with cigarettes. My dad smoked all the time, but I always saw it as a bad thing that just wasted his money. So I just had no desire to ever take it up even when some of my friends did. My mom looooooooooooves scratch-offs and would buy them for us (my brother and I) when we were kids. I was probably around your age and she’d give us the tickets on a bi-weekly basis (when she got paid). I never personally buy lottery tickets or scratch-offs, but I certainly get a few of them from my mom in our Christmas stocking each year. Rare times of year like Christmas are no problem, but bi-weekly is a bit extreme. It sounds like your mom was using you and your brother as an excuse to keep her gambling addiction going. That’s good that you didn’t pick up the habit though. I’m sure that added up to a lot of money for her. When I was around 7 or 8, my mom started having me help her scratch off her pile of tickets (quite often). Now I’m kinda wondering if that had anything to do with my love of gambling??? It most likely did. If it was a bonding experience between the two of you, you probably have fond memories of it. And if it was quite often, you probably experienced your share of winning without having to appreciate just how much money she was wasting. I think our childhood experiences play a huge role in our decisions later in life. I used to enjoy collecting hockey cards, but looking back it was an incredible waste of money. I did it more for a hobby but I could not see a decent return on it even now. I think the popularity has died down a lot. I don’t see many stores selling them anyway. Kids these days are too busy playing on their computers. It definitely was a bit waste of money, but I did really enjoy the excitement factor. Plus it taught me basic negotiating and organization skills. Those childhood gambling statistics are quite alarming. 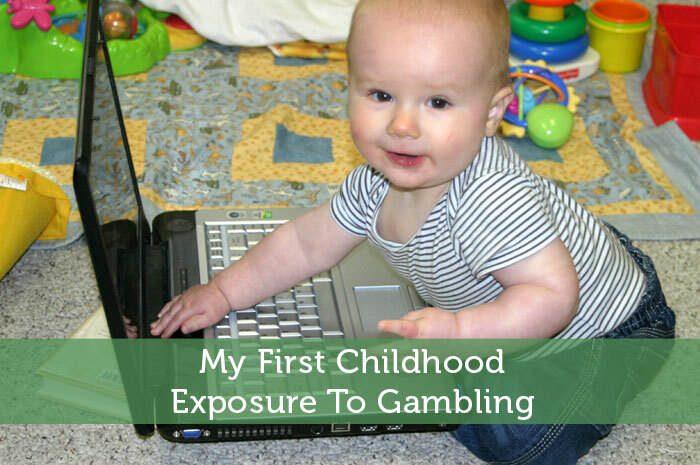 I was absolutely flabbergasted to find that a high percentage of gamblers are children. This certainly explains how so many adults end up with gambling problems. You did a great job in researching these statistics. Personally, I’ve never purchase scratch-off tickets, but this is mainly because I wasn’t really exposed to them. Today, I’ve never had any interest in them, but I know a countless number of people who swear by them. Yes those statistics are a little tough to accept. I didn’t realize it was becoming such a big problem. I guess with casinos popping up everywhere and gambling being all over the internet, kids are just exposed to much more of it today. It is a bit scary to think of how many of those cases will develop into lifelong gambling problems. I don’t gamble much anymore, but I definitely realize I have unhealthy gambling habits when I do happen to go to a casino or racetrack. I feel the need to spend my entire limit for the day in an attempt to win back my losses. Yeah, I’ve been through a lot of that myself. I started w/ scratch tickets (still rarely buy a few as entertainment if I feel like wasting a few bucks…). Did the baseball card thing (I now have over 50,000 cards in my parent’s house…). Ended up going crazy w/ blackjack, hit a hot streak – like really hot – and hung up my deck of cards before I gave it all back. My family is into Keno and scratch tickets. My mom seems to have pretty good luck (She’s won $15,000 once and $1,000 at least five times over the last three years). She insists that she spends about $40 per week on it, but who knows. I guess the $15,000 gave her a decent bank roll but even if she’s wasting $40 per week, she has the money and if she wants to throw it away, who am I to object. Wow, want to lend me that horseshoe? After thoroughly cleaning it off of course. Over 50,000 cards is an impressive collection. That must be worth a bit of money now. I recently got my hockey card collection back from my mom. It was interesting browsing through them all just to see if any of those players evolved into stars. My parents didn’t gamble for religious reasons. I didn’t realize how weird that sounds until I grew up. But the first time I was exposed to gambling was one time when my grandma let me help her pick her numbers when she came to visit. I was about seven. I was so excited….I was sure we were going to win. Of course, we didn’t. I don’t play anything other than scratch offs as an adult. And that’s on very rare occasions. I did just win $15 on a scratch off someone gave me for Easter, though! It sounds like the minimal childhood exposure helped avoid that vice later in life. That first gambling experience can be especially exciting though. When you are still naive you don’t realize how much the odds are stacked against you. You just envision all the money that you could potentially win. Funny stories! To this day, I still get excited everytime I play a scratch off and – oh – almost win! BTW – I’ve still got about a billion old baseball cards hanging around in the basement. Perhaps in 100 years they might be worth something! I guess the must be called scratch offs in the US. I like the scratch and win name better though. It’s better marketing in that it makes people think they will actually win. Those old baseball cards are probably starting to gain some value. The only problem there is that the market for sports cards has likely dwindled down a lot. So despite their book value, you might have a tough time selling them. I guess with the internet you can find a buyer for anything though. Wow. I didn’t realize that child gambling is such a huge problem. I definitely think there needs to be tighter restrictions. I don’t think I’d consider those kind of scratch and wins as gambling. Well that is unless it actually led someone to eat there way more often and really obsess over the whole thing. That’s great that you didn’t really gamble growing up. I guess you don’t gamble now either. I grew up in the height of the sports card collecting era. I used to ride my bike for miles and miles to baseball card shows. I spent every dime I had on those things. I still have them. It is now 15 years later and 95% of the cards I bought are worthless and 99% of the cards I bought are worth less than what I paid for them. But I LOVED collecting them at the time, so I don’t regret it. That sounds like some true dedication. I think if sports card collecting is done for pure enjoyment and the sake of collecting, it is a lot further from being actual gambling. Who knows maybe that 5% of your collection will continue to grow over the years. I remember wanting to buy those scratch tickets SO BAD when I was a kid. The law said not until I was 18, and my mother refused to buy them for us as it was against the law. I fumed about how it wasn’t fair. By the time I was old enough however, I had lost all interest. To this day I’ve never purchased a scratch card for myself, I’ve only occasionally received them as gifts. I really should thank my mom for not caving when I was a kid. Yes that willpower on your mom’s part may have saved you from a long term gambling habit. I think if I had been forced to wait until I was 18, I might have never bought any either. I did buy them way less once I was actually legally allowed. Maybe being underage added to the appeal. I think the closest I’ve ever come to gambling was buying a lottery ticket on my 18th birthday, and perhaps the sports card purchases as a little kid. I can remember opening those sports cards – hoping that I would get a Michael Jordan, Mark McGwire or other card from a famous player. I thought at the time that those cards would appreciate in value some day and I could sell them for big bucks. (or what seemed like big bucks to a 10 year old) Most of them are worth next to nothing these days. I think everyone buying sports cards had those kinds of dreams. As you’re waiting to buy your pack of cards, you’re bound to look around and the cards in the display cases marveling at how much they’re selling for. You just naturally think that if you keep buying more packs you’re bound to eventually get one of those big value cards. I think even if I did happen to get one of those cards, I’d probably still trade it in for a whole bunch of packs. It’s fascinating how people never remember the losing, or the amount of money they have lost or the fact that if they were likely to win that they wouldn’t be given that opportunity in the first place. If I had a penny for every time I heard someone beat the system at gambling I could probably buy a casino. People will proudly say I won at roulette and then quit when ahead and I just think, yeah, but its a losing game, you got lucky. Maybe I’m Mr Cynical, but its kept me away from gambling all my life. It’s probably a good mindset to have. Unless you’re either very lucky or a math whiz, you almost always end up losing in the long run. I do still believe there are ways to increase your odds of winning, but the average gambler just isn’t capable of properly using such strategies. Quitting while ahead is tough too. Once you are on a winning streak, you get greedy and try to win even more, until you’re suddenly in the red. My mom would play the Pick 6 (later the MegaMillions and PowerBall) if there was a really big jackpot, but otherwise, there wasn’t much in the way of gambling in my family. Although my mom does give everyone in the family and friends of family $18 worth of $1 scratch-off tickets on their 18th birthday. That was probably the first time I’d ever actually gambled. That $18 worth of $1 scratch and wins is probably a good way to set a lesson. Almost everytime you do that, you will still come out on the losing end. By that age you might be starting to appreciate money a little more and be better at accepting that the winnings are much less than what was spent. So while that 2 minutes of scratching may have been exciting, you’d be a bit bummed to be cashing them in for about $6. What you need to look out for is taking the gambling urge / addition into the investment and retirement realms. How many people hold stocks way to long trying to get their money back, or invest too much of their portfolio in a single stock in order to “win big?” The problem is that most people don’t see investing like they should, namely risk management, and effectively use their limited gambling skills to manage their retirement money. Scary stuff. Yeah I’ll definitely have to watch out for that with my less than stellar gambling sense. Rather than trying to manage it myself, I might be better off paying a company to manage it for me. It would eat into my returns a bit, but then I’d avoid the dumb decisions. This story reminds me sooo much of my brother. We lived in a tiny town growing up. My brother and I would walk to the little convenient store and they would sell us anything. I even remember being around 10 and my dad sending me there to get him cigarettes….and they sold them to me. Anyway my brother would buy scratch offs and even as an adult he will sometimes go buy $100 worth of $20 scratch offs just to win $20. I’m glad I’ve never been the gambling type. Good ol’ small towns and their slack laws. I think my childhood convenience store would probably let something like that slide too. Your brother sounds like quite the dedicated scratch and win player. Spending $100 all at once on them is much bigger scale than the average player. He’s probably under the same assumption that his odds of winning big are increasing with each big purchase. Lottery tickets don’t care if you’ve never won before though. It’s always the exact same long shot odds with each ticket. My first exposure to gambling as a child was with Vegas Dream for NES. I loved that game. It fed an unrealistic view of gambling. Luckily though I would play the football pool at my Mom’s work every week during the season and would lose every time. This made me realize how few actually win at gambling. I vaguely recall some gambling game for NES, probably the same one. I think these days they would slap a minimum age requirement on a game like that. It was relatively easy to build up a nice amount of money in that game because you could always just restart back to square one. The work lottery pool situation is interesting. It’s one of those few times where you’re pressured to gamble at an everyday location. That would be a huge burn if they ended up winning when you’re not pitching in. The thing to remember though is that a 20 in several million chance of winning is only a tiny bit better than a 1 in several million chance of winning. Even if they play each week, you’re probably still more likely to be struck by lightning. My parents aren’t gamblers at all. Once in a while (Christmas stockings) my mom buys a few scratch offs. Gambling is such a powerful addiction, whether it’s scratch offs, lottery tickets, horse racing, or just making risky decisions. In my line of work we help a lot of people with addictions (drug and otherwise). I never realized how much gambling addictions can ruin peoples’ lives until I started working in the field. Unfortunately some people just have factors that make them more prone to addiction. Also it’s often multiple addictions that go hand in hand. If you’ve got a gambling addiction there’s a pretty good chance you may also be battling other kinds of addiction. Adding to the problem is that many people just don’t understand addiction and look down on those people. When you’ve got an addictive personality though, it can be a lot more difficult controlling those urges. Your “adventures” remind me of mine :). As a kid I was taught by my parents and grandparents that gambling bad. I was told that it is addictive, people lose money thinking that they would win next time. I perfectly believed them and was always sure that I would never fall in trap of gambling. when I was about 12 years old, there was a carnival at my school. Many of my class mates/school mates had set up stall. I had my pocket money which I was about to spend to eat an icecream. Then I went past a stall which would allow me to throw a ring on a toy. I told them that my pocket money is for the icecream but they (a few of my class mates) insisted to try it for free but there would’nt be any prize money. I decided to give it a try , just for one. Out of 3 chances I hit all the 3. Wow!! I decided to play, this time with money so that I could get a prize. I tried again. But this time I failed – all 3 times. Then I called my younger brother. I played on his pocket money too. failed again! Then we borrowed some money from my teacher. oops failed again. Both me and my brother were sad while everyone else was enjoying that day. That was a big lesson for me and I would never forget my entire life. Thanks for sharing your story Karunesh. Sounds like someone was being sneaky giving different rings for the free throws. Carnivals are quite notorious for making their games quite difficult to win. You’re right that is can be a form of gambling too. It may not initially seem like it since you are just trying to win toys, but it is setup in such a weight to lure you into spending more and more to try to win. The ones that I hate are when you win only to be told that you don’t get the big prize. No instead you get the little one and have to work your way up to the big one, spending much more money. I was the legal age when I got my first taste. It is very regulated where I live in Canada. As far as playing games as kids go, gambling games weren’t part of the picture. Just classics like Monopoly and Stock Ticker. I think in Canada they haven’t tightened up the restrictions somewhat since I was a kid. Still I’m sure convenience stores in small towns might look the other way with those kinds of laws. I wouldn’t consider those kinds of board games to be gambling. They probably actually teach all kinds of financial lessons. I was an avid baseball card collector, sometimes I still flip through my book of MJ cards. He was by far my favorite athlete. I think I have over 200 of his cards…I am like short road to retirement, I would spend all my money on the cards. They opened up a baseball card shop in the plaza behind my house, needless to say all my allowance went back there. We used to spend hours in the shop everyday. My grandmother used to play scratchoffs and would let us scratch them off for her. Of course she always won…then when I got older I bought them and im a loser!! If you’ve got over 200 MJ cards those might be worth something now, probably even more down the road. I never got into the magic card trend. Where I lived those were kinda looked down upon by the ‘cool’ kids. It seems like the odds on scratch offs (I’ll use the American terminology this one time) have really dropped over the years. The last few times I’ve played I think I did even worse than normal. I definitely don’t play much these days though. I don’t know what’s more disturbing; the fact that the store clerk sold you tickets when you were just a tot or the fact that you were roaming the streets by yourself at that age! WITH MONEY IN HAND?! It was a different world then, wasn’t it? I don’t even let my boys who are older than that ride their bikes out of my sight. Too many weirdos. Gambling is super addictive, but I wonder if the fact that you still occasionally play is more about your genetic make up than the fact that you were so young when first introduced? I just don’t have an addictive personality. I don’t smoke, I don’t drink (much), I don’t gamble at all….I did buy a stupid lottery ticket recently, but Jeff wanted one and he was driving and asked me to jump out and grab one. I’m not perfect…I do like to shop for clothes that I don’t “need” but the more popular vices I can take or leave. I think it was pretty normal for kids my age to wander the neighborhood where I lived. Being such a small town, I don’t think it was all that risky. Since my parents divorced when I was young, it’s not like my mom could watch us all the time. Yeah it’s tough to say if it’s genetics or childhood experiences that affect a person more in regards to such addictions. My mom didn’t have any addictions that I can think of, but I can’t say the same about my dad. So maybe it was more genetics in my case, but then again it could’ve just as easily been me learning from watching my dad. I know someone who’s family was big into gambling, and they would do it “just for fun” on the weekends. They probably lost thousands of dollars gambling for entertainment. One of the family got carried away with gambling, and became an addict. In the end she ended up embezzling over a hundred thousand dollars from her workplace to gamble before getting caught. She’s now serving a 5 year jail sentence. Ouch, now that is some extreme gambling. Well I know my gambling habits will never get to that point. That lady obviously wasn’t a very good gambler to lose that much. Or maybe she just got caught up chasing her losses. For some reason I have no desire to gamble at all, but my fiance is always egging me on to get scratch tickets at the grocery store. The one time (and I literally mean, THE ONE TIME) I gave into him, we ended up winning $25.00. I have yet to live that down. Haha the lottery ticket vendor must have smelled fresh blood and purposely gave you a winner ticket to sucker you in. I’d believe those odds. Getting someone else to go instead is pretty silly though. Some people can be a little bit too superstitious. Great post! I buy a lottery ticket once a while when the jackpot gets big. I won some money of blackjack on BC Government gambling website and have not gone back for a while. I wouldn’t say i’m addicted, but I enjoy (winning) and understand the limitations. As long as you keep it to a responsible level, there’s nothing wrong with the occasional gambling. If the price is kept low, it can be worthwhile entertainment. There are worse ways to spend a few bucks here and there. My father used to let do the lottery number selection. But thankfully I never really got fond it. I’m just one of those who just weren’t interested. I guess seeing both my parents being so into it was the major turn off for me. I’m glad to hear that you saw the negative side of it rather than just following in their footsteps. When parents gamble, the children really can go either way. Wow, that is super unethical – 16 or 17 is one thing for selling tickets to minors but 6 or 7?! That’s just insane. I never gambled much and that’s mainly because my parents never really cared for it. I played bingo once and won $30, and then buy a Set for Life once a year or so. Yeah tell me about it. Some people just choose to put profit before ethics. I’m surprised you didn’t continue playing bingo after winning $30. I’d thinking winning on your first try would make it that much more tempting. I’ve never bought a lottery ticket (which I’m quite proud of lol) but I have been tempted. Being from the Texas, I grew up on Poker card games like 5 Card Stud and the infamous Texas Hold-em. We never played with real money, just mostly poker chips until I was a teenager. Then we would use real money. I was too cheap/afraid to lose money, so I didn’t participate much. Apparently I’m not a convincing liar. Ha! I enjoy a good game of poker sometimes. Other than online and with friends at home I’ve never played competitively though. It’s easy enough to fool friends or people who can’t see your face online, but in a real game you have to be pretty convincing.